The Core P5 wall-mount chassis is designed for use in three different ways: Wall-mount, vertical, and horizontal placement. Built for customization that reflects the makers’ personality, it allows for adjustments to the chassis for the best viewing presentation while ensuring outstanding cooling performance. 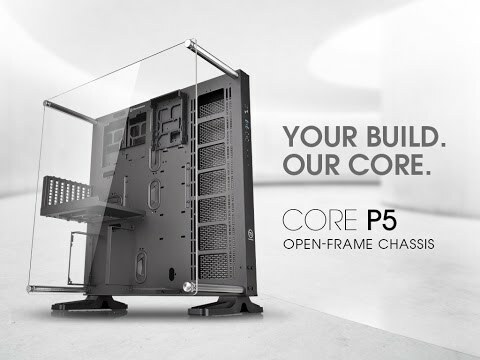 Other cases in the market still have “ends” on their open frame designs, while Core P5 is a true wall-mount case with viewing capability of showing front and back full sides unlike anything on the market that is not a modded design or scratch build. ThermalTake Core P5 Black Clear Acrylic Mid Tower Gaming Case, Horizontal/Vertical/Wall Mountable w/o PSU is rated 4.8 out of 5 by 13. Rated 4 out of 5 by Straycat from A superb case I bought this case with the intention of wall mounting it, and putting in a custom water cooling loop (a first for me) In short - it's an excellent case. It is HUGE... but well designed, sturdy, and cable management (not my strongest skill) is extremely easy - so it's a good case for making a nice looking machine. Be aware though that there is no point in buying this case unless you want to take that extra time and make something a bit special - you're better off with something more standard. It isn't perfect. There's only mounting holes for Thermaltake cooling components - so for anything else, you'll find yourself drilling holes in it. Although that was a given for me, as I wanted to mount it on a wall to the left of my desk, which meant an inverted build - so drilling extra holes was about the first thing I did to it. There's nowhere to mount optical drives, although you can download plans to print mounts for such. And while it's great that you can hide away three internal drives inside the back plate, there's no easy way to attach fans to cool said drives. Oh - and don't plan on an inverted build if you want to attach the feet. There's reinforced mounting points for the feet on the bottom of the case, but not the top. The PCI riser cable and mount is a bit fiddly (especially if you're using more than one PCI card) - and there's only one supplied cable, so if you want to add more than one PCI card and use the riser, you'll need to pay for more riser cables. Finally - I had a long debate with myself on whether to get the tempered glass edition or the acrylic front. In the end, I went acrylic... then later splashed out on the glass edition. My advice - the acrylic looks good, but the glass is so much better that I regret not going that way from the outset. Pros: Great looking, well designed, sturdy case Easy to build for clumsy people like myself Perfect for extreme water cooling VESA-compatible wall mount points. Cons: PCI riser is a bit fiddly (although it looks good enough that it's worth using) Despite the open layout, it's *more* fiddly to open up for routine maintenance than a standard case Heavy Insufficient mounting points, which might require some drilling. Rated 5 out of 5 by Joshy from Great modification capabilities Easier to manipulate then other computer cases. However it is more compatibile with components from the same company, which makes sense. I did have to make a few brackets for my custom loop system but the multiple screw holes made it easy. Rated 5 out of 5 by onatural from behemoth noun: behemoth; a huge or monstrous creature. This noun sums up the Core P5 perfectly! It is a beast with a full custom water loop in mind. If your going to buy one be prepared to spend £300-500+ on water cooling parts to compliment it. If you plan on using an all in one AIO pump/res combo then buy a P3 or P1 The customisation possibility's are endless (just have a google) it's definitely made with modding in mind, I plan on wrapping mine in 3M carbon vinyl. I wouldn't call this a computer case, It's a display case for your computer components. Rated 5 out of 5 by Evian1040 from A dream case Just like the title says, this is a dream case and a must have for all who love water cooling. It's heavy so be careful, but it looks like it can last 20 years. Rated 4 out of 5 by AlexanderWatts1 from Great Product This a great addition to any high end gaming computer and looks great, I would recommend that if you do get this case then you need to have the water cooling ready for installation as the case looks bear and empty without it. Great product, fits a high end gaming computer well and gives off a great look and feel to the computer. Does the case come with the brackets for wall mounting or are they a separate purchase? Any ideas if the chassis would be strong enough to take replacement of the acrylic side panel for a specialist made bevelled and tempered glass panel? Tough question I know, sorry, you may have to refer to ThermalTake. I would say yes. I bought the tempered glass upgrade kit for mine, and it uses the same posts that mount the acrylic panel - it simply provides one side panel, one for the top and one for the front... so the posts are plenty strong enough for that much weight. Looked everywhere, including Thermaltake's site. The best I've found is 'later this month' I'm just wondering, since I'm building a new System, and I really fancy using this case, but I'm rather impatient and if its gonna be a few weeks, I'll just use something else. Hi, I am planning on new build and new PSU, it will be the ROG Thor that should come out shortly, however I don't want my PSU to be facing flat against the side like it's shown, can I just mount it like in default PSU orientation ? I can't find any pictures supporting this and only phrase on TT website is : &quot;Show off your graphic card and power supply with our special design bracket. 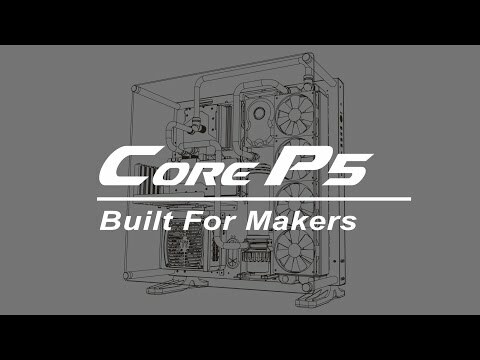 The Core P5 TG has included a standard riser cable for you to choose the way you want to build the system. Further, the Core P5 TG also has the support for vertical PSU layout when ITX motherboard is applied. &quot; Also I've seen the smaller model the Core 3 to support the default position however there's a strap going through the middle of the PSU and I don't want that either. Anyway, hopefully someone can answer this for me. Have a great day!